IN CAPE BRETON, WE SPEAK TRANSLATE! The Cape Breton Local Immigration Partnership (CBLIP) recently teamed up with Local Immigration Partnerships across Atlantic Canada to receive web-based training in the Google Translate app, through the We Speak Translate project. We Speak Translate represents a unique collaboration between Google Translate and the Inter-Cultural Association of Greater Victoria (ICA). The project launched in Victoria in April 2017, spear-headed by ICA’s Community Integration Coordinator, Kate Longpre. The focus of We Speak Translate is on the use of the Google Translate app in the context of refugee resettlement and newcomer inclusion in communities. Three individuals from Cape Breton took part in the recent training, recognizing that language is one of the most significant barriers to newcomer integration in Cape Breton. The project involves training community stakeholders, organizations and institutions in the Google Translate app. Training is free, takes 40-50 minutes, and is offered by ICA either in person or via webinar. 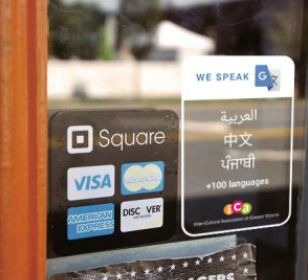 Upon completion, participants can receive a We Speak Translate decal, a visible symbol of inclusion and commitment to promoting diversity and communication across language barriers. To date, ICA has trained over 1800 individuals across Canada through We Speak Translate. Familiarity with the app helps to create a common platform for communication while newcomers develop English or French language skills. This is a fantastic opportunity for community members, non-profits, businesses, and institutions to demonstrate their commitment to a diverse and inclusive Cape Breton – and to make settling here a little bit easier for newcomers. We Speak Translate from ICA Victoria on Vimeo. Anyone in Cape Breton who is interested to take part in We Speak Translate training can join an existing webinar or connect with ICA to organize training for their own group at a convenient time for everyone. The minimum number of participants is eight. Hear how others are experiencing We Speak Translate through their recent evaluation info-graphic.